An investigation is under way after another one of London's bendy-buses caught fire. Firefighters were called to New Cross, south east London, on Saturday after the engine of a 436 bus caught fire. No one was injured. One year ago all of the capital's 130 bendy buses were taken out of service following three separate fires. Transport for London, in charge of bus services, said while the incident was cause for concern it was not serious. The spokesman told BBC News the bus had been taken to a garage for inspection. "While we're expressing concern about the incident, it's not what we would term as a serious fire. "No damage was caused to the passenger compartment and the bus was evacuated promptly." 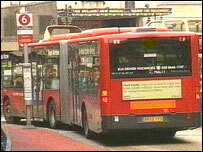 Between December and March 2004 fires gutted three of the £200,000 buses and the whole fleet was taken out of service. A hose used in the bus engines was identified as the problem.